Not just once, but repeatedly, I have heard something like “I just didn’t see in science any room for my own imagination or creativity,” from young students clearly able to succeed at any subject they set their minds to. It is a tragedy that so many people do not perceive science as a creative. Yet it doesn’t take an Einstein to observe that without that essential creative first step of re-imagining what might be going on behind a natural phenomenon, there can be no science at all. Every scientist knows this, but for two centuries we have been quiet about the imaginative first step of science, preferring stories that stress the empirical method or the logic of scientific discovery. Science education is full of it, focussing on final results, rather than the journeys toward them. Human stories of wonder, imagination, failed ideas, and glorious moments of illumination thread through the lives of all who actually do science. No wonder my young colleagues became disillusioned. If scientists are somewhat shy about their experiences of imagination, then I found that the artists, writers, and composers with whom I spoke to could be equally reticent about their repeated need to experiment. Scraping the paint from the canvas, re-drafting the novel for the tenth time, rescoring the thematic musical material is, as every artist knows, the consequence of material constraints. Artists, as well as scientists, make initial hypotheses about how their material, words, or sounds will achieve the goal in mind. The simultaneous birth of the English novel and the experimental method in science turns out, for example, to be no coincidence. Without making the naïve claim that art and science doing the same thing, the similarities in the experience of those who work with in those fields are remarkable. The project of listening to anyone who creates—be it with music or mathematics, oil paint or quantum theory—and the creative power of the constraints creators encounter, became a fascinating project. A pattern of three modes of creative expression emerged. The first mode is visual imagination. This is, of course, primary for the artist, but the same mode of creative expression is also important for many scientists, from molecular biologists to astrophysicists. Astronomy creates the first artists canvas. If the observer of a painting is asked to re-create a three-dimensional world from a two-dimensional picture, then the same is true of understanding the universe from the picture that we call the sky. A second mode is textual and linguistic. Its threads tie together science and the written word, in prose or poetry. They possess a principle knot at the birth of the novel, but its story is a much longer one. Science and poetry also have an alternative history, envisioned by William Wordsworth in the Preface to his Lyrical Ballards: “The remotest discoveries of the Chemist, the Botanist, or Mineralogist, will be as proper objects of the Poet’s art as any upon which it can be employed, if the time should ever come when these things shall be familiar to us.” With notable exceptions (such as R.S. Thomas and occasionally W.B. Yeats in poetry, and the ever-present fluttering trespass of Vladimir Nabokov’s beloved butterflies from his scientific work into his novels) this early-Romantic vision has sadly yet to be fulfilled, frustrated by the very desiccated presentation of science with which we began. Imagination’s third mode appears as both pictures and words fade away. For there, when we might have expected a creative vacuum of nothingness, we find instead the wonderful and mysterious abstractions of music and of mathematics. This shared space is surely why these two have something in common. It is not their superficial sharing of numbers that links music with mathematical structure, but their representational forms in entire universes of our mental making. Other disciplines can help make sense of all this. The anthropology and cognitive neuroscience of creativity is fascinating, the one taking us to the stone tools of our distant ancestors at the dawn of humanity, the other to the delicate balance between the different functions of our brains’ left and right hemispheres. Philosophy is equally illuminating. Emmanuel Levinas teases out, for example, the difference between the visual and musical modes of imagination: the first distances us from the object, the second immerses us within it. Theology applies its critical tools to the role of purpose in human creativity. Both the artistic and scientific modes of re-imagining nature seem to have been part of what drives activities special to our species’ search for meaning. They embody the rich tradition of humans understanding themselves. As George Steiner wrote in his wonderful account of art and meaning, Real Presences: “Only art can go some way towards making accessible, towards waking into some measure of communicability, the sheer inhuman otherness of matter.” Precisely the same could be said of science. Tom McLeish is Professor of Natural Philosophy at York University, where he works with chemists, engineers and biologists in universities and industry to connect material properties with their molecular structure. 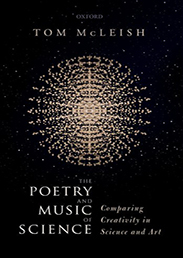 He also works on connections between science and policy, history and the humanities, resulting in the recent books The Poetry of Music and Science (OUP 2019) and Faith and Wisdom in Science (OUP 2014). As I can think, there is always a distance between the subject of its ‘‘self’’ and the object of ‘‘other’’, which cannot be covered only by the direct sense of the object – out of ‘‘self’’ – as ‘‘other’’ indicating the object of science. Between the self and the other there is a whole universe (which we often indicate as space of ‘‘truth’’) which can be grasped only by the ‘‘objective imagination’’ motivated by a reason in self as independent from the other: Namely, by establishing the relation between the subject and the object, as relation between self and the other, covering the space of the whole as one indivisible space of a ‘‘Unit’’, of which the ‘‘self’’ and the ‘‘other’’ are the only known parts of one indivisible truth of the whole. Thank you for reading this. Gregory Tzanetos.